1. If a/b=c/d then what is the value of (ab+cd)2? 4. The first and last terms of AP are 75 and 171. If there are 9 terms in this sequence, Find the sum of third and fifth terms of the sequence. d (Common difference) = 12. So 3rd term is 75 + 2×12 = 99 and 5th term = 75 + 4×12 = 123. So the required answer is 99 + 123 = 222. 5. 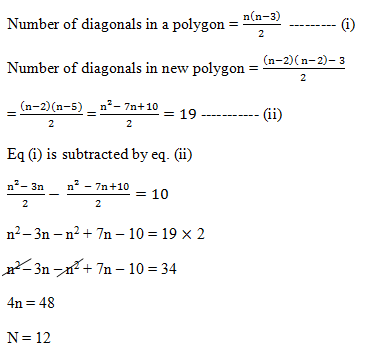 There is a regular polygon and if we reduce it’s no of sides by 2 then its number of diagonals reduced by 19 then how many sides does it have initially? 6. If cosec y+ cot y=2+ √3 Find the value of tan 3y/2. 7. P and Q completed a job by working alternate days. They took a total of ten days to complete it. Find the time required to complete the work if they work together? In a class, average age of 30 students is 18 years. If the ages of 2 more students are taken into consideration, then the average of all the students gets increase by 1. Find the average of the ages of those 2 students. A certain number of people decided to meet in XYZ College in an alumni meet and decided to construct a block for XYZ College. But every month four people step out of this plan. Due to this the task is completed in half more year instead of one year. Then how many people were originally involved in this plan? 10. Find the decreased percentage of volume of the circular cylinder which radius and height decreased by 20%. 1) If a/b=c/d then what is the value of (ab+cd)2? 4) The first and last terms of AP are 75 and 171. 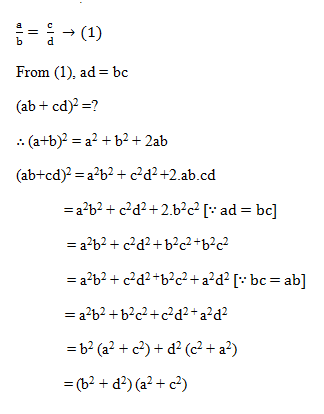 If there are 9 terms in this sequence, Find the sum of third and fifth terms of the sequence. 5) There is a regular polygon and if we reduce it’s no of sides by 2 then its number of diagonals reduced by 19 then how many sides does it have initially? 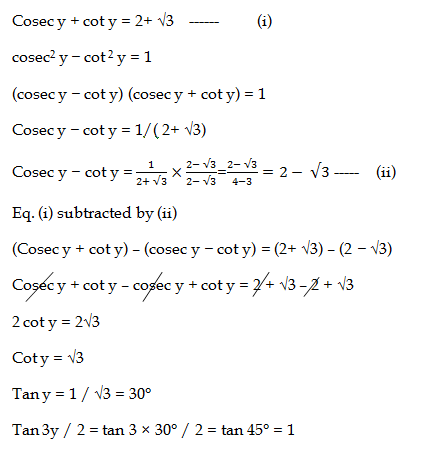 6) If cosec y+ cot y=2+ √3 Find the value of tan 3y/2. 7) P and Q completed a job by working alternate days. They took a total of ten days to complete it. Find the time required to complete the work if they work together? 8) In a class, average age of 30 students is 18 years. If the ages of 2 more students are taken into consideration, then the average of all the students gets increase by 1. Find the average of the ages of those 2 students. 9) A certain number of people decided to meet in XYZ College in an alumni meet and decided to construct a block for XYZ College. But every month four people step out of this plan. Due to this the task is completed in half more year instead of one year. Then how many people were originally involved in this plan? 10) Find the decreased percentage of volume of the circular cylinder which radius and height decreased by 20%.